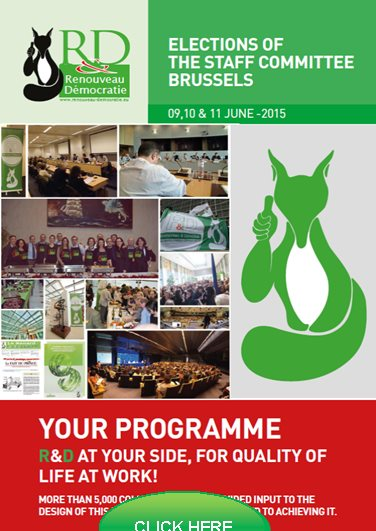 R&D Council and R&D Committee of the Regions win the statutory elections! 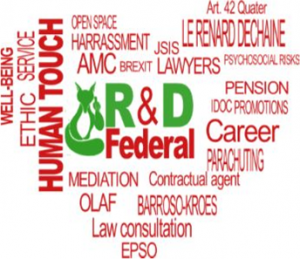 R&D federal consolidates its role of Leading Union at the level of all institutions! R&D federal consolidates its role of Leading Union at the level of all institutions! We are pleased to announce the stunning victory of 26 seats out of 30, 8 seats more in comparison with the previous elections, of R&D Council in the elections for the Staff Committee, which consolidates our role not only with our colleagues in the Council but also with all the colleagues in the European Union, through our commitment to R&D Federal. On the occasion of these elections, R&D chose to meet the challenges of tomorrow by drawing up a joint list with all other union forces which were present and with some non-union colleagues. Thanks to the results obtained by its candidates, as in EESC, R&D confirms its role as the leading union within the Committee of the Regions. This need for coordination is all the more essential for the staff of our institution. As R&D denounced repeatedly DG HR decided to penalize Commission colleagues, by applying the Staff Regulations in a more restrictive way compared to the other institutions. R&D Federal is above all a community of values! Within each institution and in all places of employment, we demand transparency of procedures, we oppose abuses and “parachuting” …. we defend the rights of colleagues by also offering the help of a pool of specialized lawyers to guide, help and serve you better. Solidarity being the foundation of our joint action, we do not spare our efforts to assist and defend our colleagues in precarious situations, without ever making deceptive promises, nor playing demagoguery. Our commitment remains the same: to justify the trust shown by our colleagues and report on our actions at all times. We are all the more proud that those results were obtained without renouncing our common values which are at the heart of the activities of all sections of R&D. Commitment, Determination, Success… R&D, it’s a Human touch at the service of all Staff!